It features now a line sensor for line following, remote control and Command Line Shell support through 802.15.4 plus an ultrasonic sensor. The IEEE802.15.4 Transceiver card is now integrated with an Adapter Card on top of the FRDM-KL25Z. The Adapter card makes the connection for the IEEE802.15.4, Line Sensor Array and Ultrasonic HC-SR04 Sensor. An Arduino proto shield is used for mechanical connectivity plus exposure of the FRDM-KL25Z Reset button. The Pololu Tracks worked well on carpet, but not good enough on other surfaces. To improve the grip of the tracks on different surfaces, I have mounted pads on the tracks. 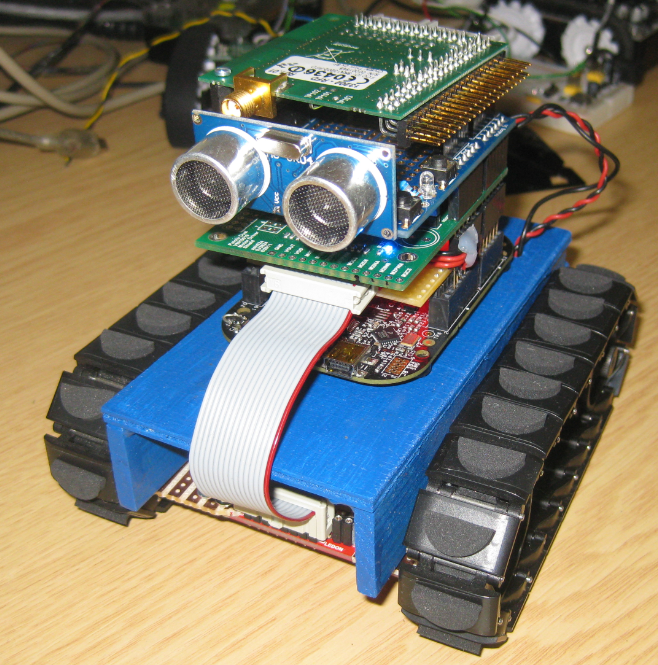 The project features now a radio module which allows to send commands to the robot: the radio module implements a wireless gateway to the robot. a string is sent to the robot. 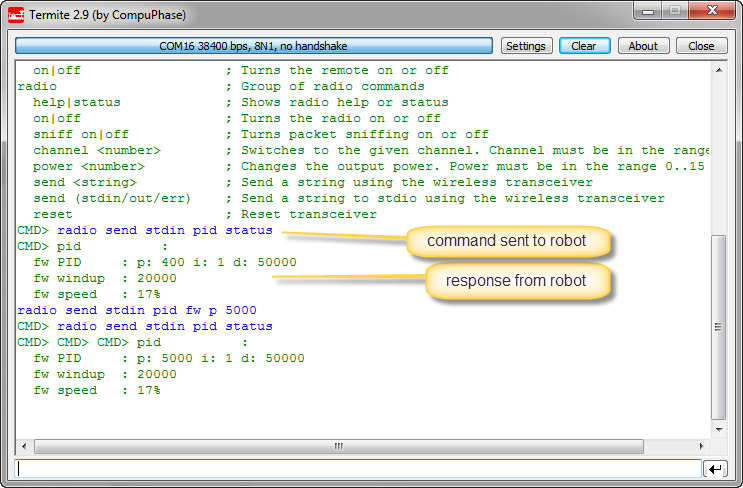 a command can be sent to the standard input I/O channel of the robot. The robot is using standard input, output and error channels. This makes it easy to send and receive commands and status messages to and from the robot. With the platform.h header file, the project can be configured. For example to add line following, maze solving or acting as a remote controlled robot. With this I have an autonomous robot based on the FRDM-KL25Z board and a chassis from Pololu. 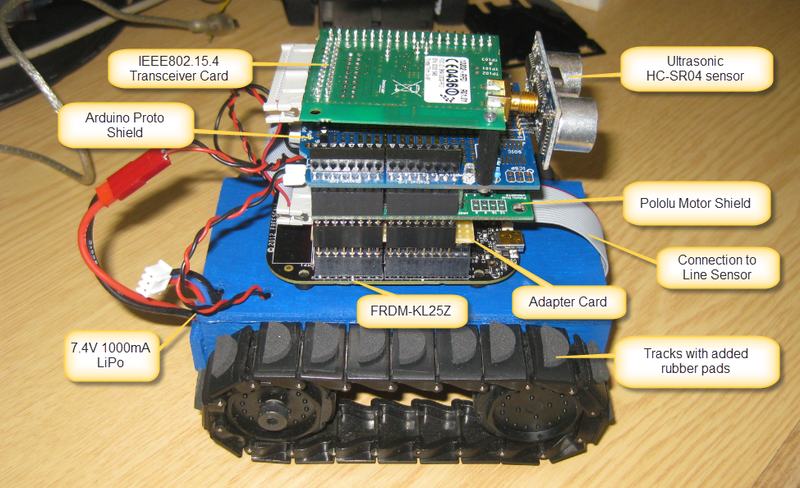 It performs line following and maze solving, and can be controlled by a remote shell or controller unit (e.g. with an accelerometer). 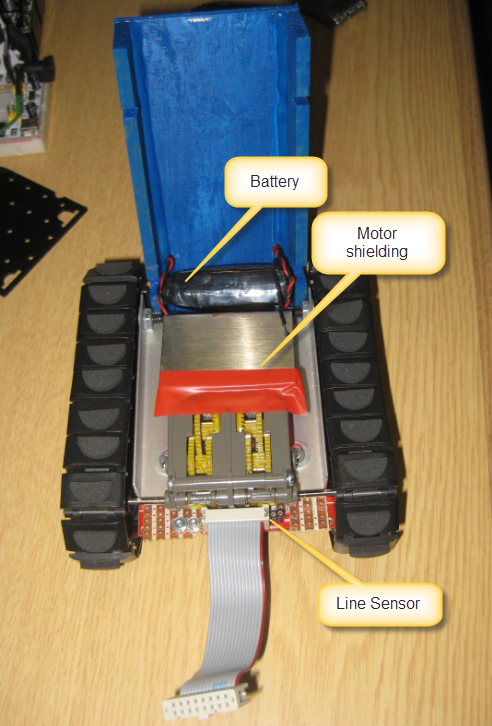 I plan to add at least one servo motor so the ultrasonic sensor can scan the surroundings. Then it is just a small step to solve a maze built up with walls instead of lines :-). The sources for the CodeWarrior for MCU10.4 project are available on GitHub here. This entry was posted in Embedded, Kinetis, KL25Z Freedom Board and tagged codewarrior project, freedom board, KL25Z Freedom Board, open source projects, Processor Expert, software, software project, technology by Erich Styger. Bookmark the permalink. Yes, I wanted the ultrasonic sensor on a servo too. But the Freescale ARM parts have very limited PWM and timers, which made it hard beside of driving the motors. AT the end I decided to turn the robot instead of turning the sensor with a servo: not as ideal, but used less mechanical parts and PWMs.